It is evident in today's economy that companies are getting "squeezed" and challenged to drive down supply product and distribution costs. On one side, our customers want supply products for less cost, with better service. At the same time your own company is pressuring you to reduce inventory and distribution costs. This becomes more complicated when your company may not have the resources, systems capabilities and freight volumes that other competitors have to drive continuous cost reductions and service improvements. Joshen Paper has better visibility of your supply product needs by integrating data from our sales, procurement, and fulfillment systems. As your company may be being forced to move to just-in-time inventory models, there may not always be enough on-hand inventory in your warehouse to satisfy orders. Allocating available inventory against current orders creates time-consuming problems and subjective internal decisions. Your solution is better integration of sales and inventory data, with high-fill rates. Joshen Paper has the experience and resources to integrate data from multiple systems to facilitate decisions by maximizing product on-hand inventory; allowing you to focus on growing and managing your core business. 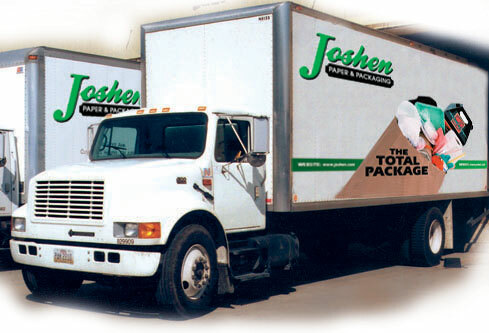 Joshen Paper is Your Distribution Solution! Whether you service your own locations, are a wholesaler, or both, Joshen Paper's Distribution Programs are a proven distribution cost reduction strategy! Partnering with Joshen will reduce your storage costs and your labor to receive, put away and pick inventory of supply products. Joshen Paper is the expert in distribution program coordination. When implemented, Joshen's programs can significantly reduce your warehouse storage and labor costs while still meeting high fill rate requirements of your locations and customers. Joshen maintains the supply product order history in our database to insure maximum inventory levels to maintain your high fill rate requirements. Imagine not having to create purchase orders to a multitude of suppliers any longer? You will experience soft cost savings as well. Joshen's experienced professionals understand the supply chain. Joshen Paper is the right third-party warehousing and logistics partner to assist your company in generating big savings without major capital investments. Listed below are Joshen's Distribution Program Models and services that are ways that your business segment can leverage Joshen Paper to compete and win in your competitive market. To begin the process of driving down your supply and distribution costs, contact us today! Be a part of Joshen's S.M.A.R.T. community of customers.